The Centre for Criminology & Victimology at National Law University Delhi organized an INTERNATIONAL WORKSHOP on LEGAL RESEARCH METHODS, Under the aegis of Professor Theodore Eisenberg Centre for Empirical Legal Research & Internal Quality Assurance Cell (IQAC) from May 22 - 28, 2017. The inaugural session of the workshop was held on 22nd May 2017 & it was graced by the presence of Professor (Dr.) Shashikala Gurpur, Director Symbiosis Law School Pune, Prof.(Dr.) Ishwara Bhat, Vice Chancellor, The WB National University of Juridical Sciences, Prof.(Dr.) G.S. Bajpai, Registrar National Law University Delhi. The 7-days workshop covered around 20 lectures by some prominent speakers namely Mr. Harish Narasappa, Founder, DAKSH, Dr. Bhawna Bali, Assistant Professor, Teri University, Dr. Sudeshna Ghosh, Mr. Rahul Magan, Chief Executive Officer (CEO), Treasury Consulting LLP and Dr. Neeta Goel, Senior Evaluation Specialist, International Initiative for Impact Evaluation and many more. During the workshop following interactive sessions were held. Basics of Empirical Legal Research. Empirical Legal Research approach to the selected issues relating to judicial administration and judicial reforms (like research on arrest, bail, review & revision, delay & pendency, etc.). Developing research design for Empirical & Doctrinal Legal Research. Developing research proposal for Empirical & Doctrinal Legal Research. Training in tool construction for data collection in ELR. Training in data analysis techniques. More than 50 participants including students, research scholars, academicians and law teachers from the reputed institutions across the country and faculty members from NLU Delhi took participation in the workshop. The participants appreciated the sessions, very positive feedback was received from the participants. The program was anchored by Prof (Dr.) G S Bajpai and coordinated by Mr Sidharth Dahiya, Assistant Registrar (Academic & Coordination). It was a collaborative talk on the topic of Restorative Justice attended by approximately thirty people from different fields across the state. All the participants were from varied fields such as Psychologists, Criminal lawyers, Judicial persons of District Legal Service Authority, Social workers and academia. Such diversity represented the common interest and responsibility towards progressing society. wo Day National Seminar on Caste Panchayats, Democracy and Constitutional Values was organised by the Centre for Social Inclusion and Minority Rights, National Law University, Delhi on 15-16 April 2017. The National Seminar was attended by more than 50 participants from different parts of the country. About 40 participants presented their insightful research papers pondering on various critical issues of the subject matter. The National Seminar was convened by Dr. Vinod Kumar, Associate Professor of Law (NLU Delhi) and inaugurated by the Vice Chancellor of the University. The Key Note Address was delivered by Upendra Baxi, Professor Emeritus Warwick University. 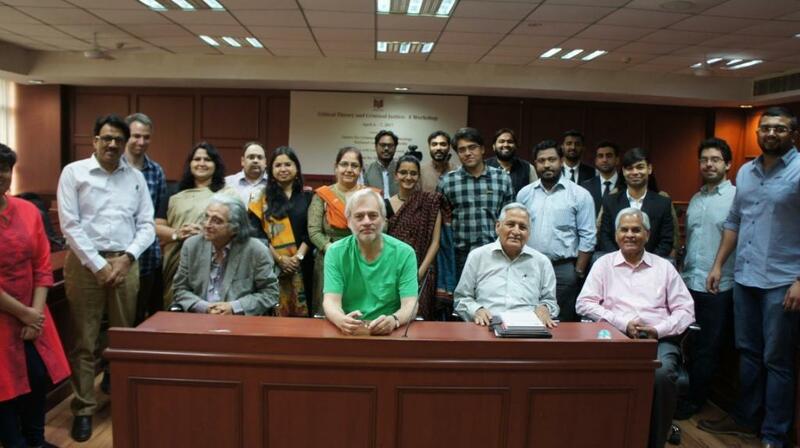 A Two Day Workshop was Offered Engaging Critical Theory And Criminal Justice Perspectives In The UK And India. 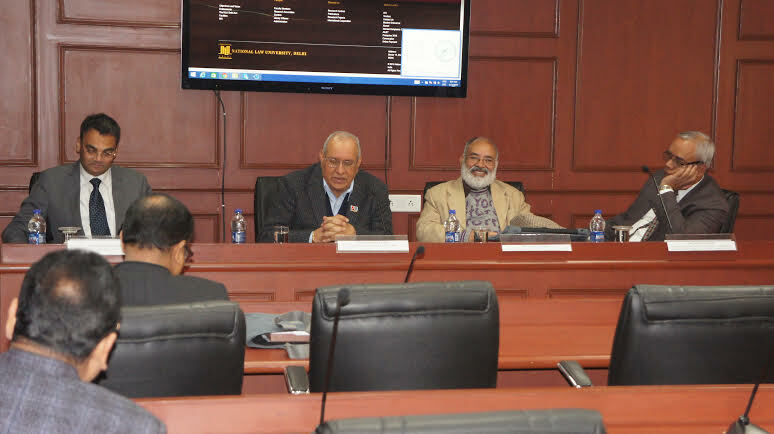 This Workshop was Offered To Postgraduate Students And Legal Faculty By UK And Indian Scholars In The Critical Realist Tradition: Dr Henrique Carvalho (Warwick), Professor Alan Norrie (Warwick), Dr Craig Reeves (Birkbeck, London), Prof. B.B.Pande, Prof. G.S. Bajpai, Prof. Ratna Kapur. 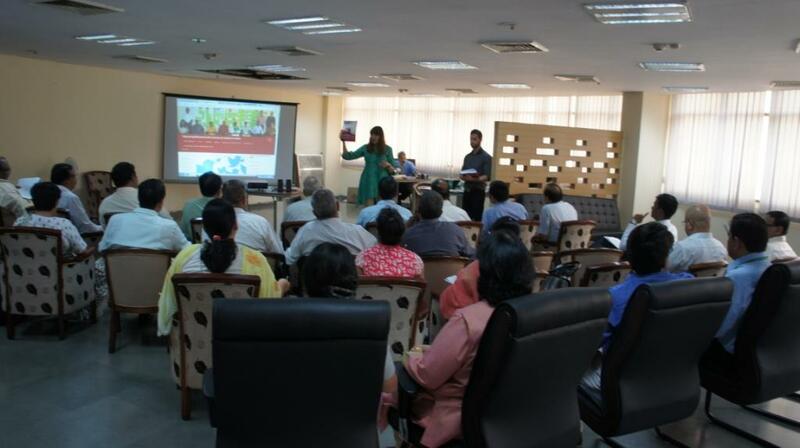 It Offered, And Invited Presentations From Indian Colleagues. On, Issues Regarding Law And Violence, Emancipation And Love, And The Possibilities of Legal Dialogue. 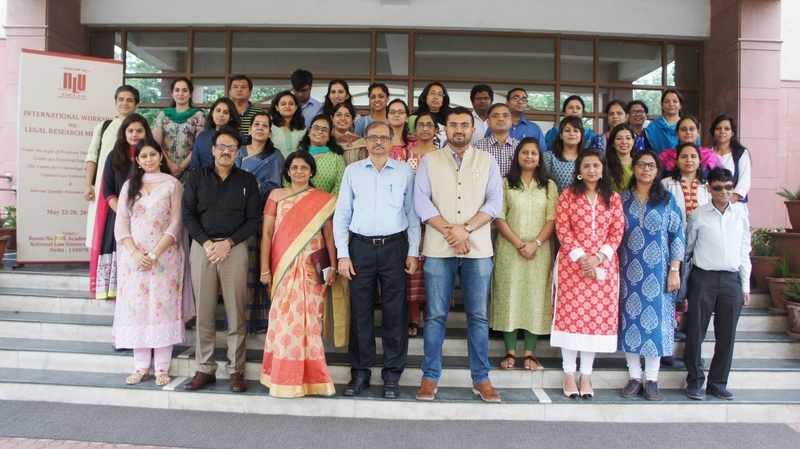 Center for Criminology & Victimology ,NLUD and Helena Kennedy Center for International Justice , Sheffield Hallam University organised a Training of Trainers workshop in Collaboration with the BPR&D, New Delhi. An expert team consisting of Dr. Sunita Toor & Mr. Peter conducted an intensive three days session at National Law University Delhi from April 5 - 7, 2017 to mainly focusing on gender issues. 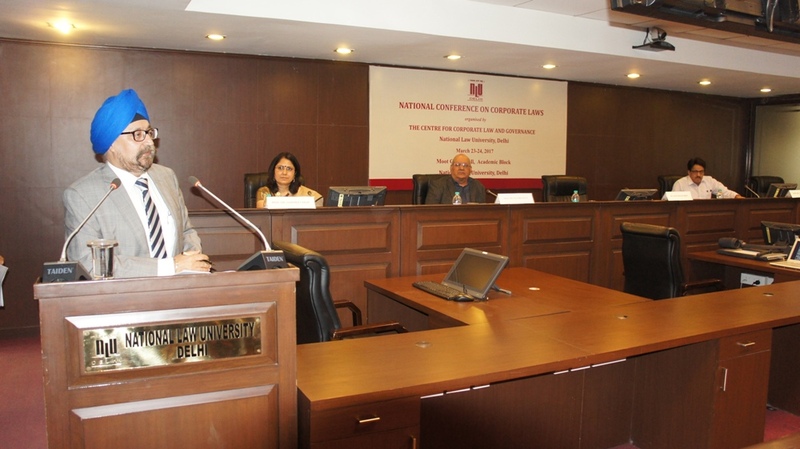 The Centre for Corporate Law and Governance, National Law University Delhi organised a two day National Conference on Corporate Laws on March 23-24, 2017. Almost 28 papers on different issues of Corporate Law including contract Law, Mergers & Acquisitions, Corporate Social Responsibility, demonitisation, Intellectual Property related issues, Issues related to insolvency, bankruptcy, taxation and Competition law were presented. The inaugural session was chaired by Mr. Inder Mohan Singh, Partner, Shardul Amarchand Mangaldas & Co. The panellists who chaired the other sessions were Mr. Sanjay Maria, Advocate Delhi High Court, Prof. T C James, President, NIPO, Sh. Dhanendra Kumar, Former Chairman, Competition of India and Mr. Sumant Batra, Managing Partner & Head, Kesar Dass B. Associates. The conference was attended by faculty members, professionals, academicians, researchers as well as students. The Centre for Criminology and Victimology and The Centre for Constitutional Law, Policy and Governance at the National Law University, Delhi in collaboration with the Pepperdine University School of Law organized a two day Conference on Pre Trial Processes under the aegis of IQAC on the 14th and 15th of March 2017. The inaugural session was presided over by Prof. (Dr.) Ranbir Singh, Vice Chancellor, National Law University Delhi. Prof. Singh in his introductory remarks emphasized on the importance of collaborations between universities to understand the differences in culture and to make the best out of available resources. 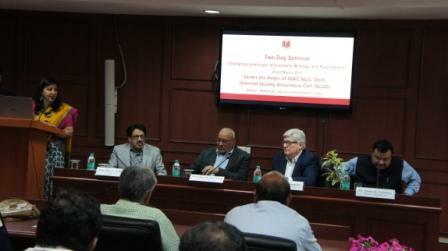 The first panel gave an overview of pre trial processes in India and the US. Over one and a half days, topics including Pre-trial detention and access to legal counsel and bail, disclosure of evidence, juveniles in the criminal justice system, the role of sentencing guidelines in pre-trial case resolution and plea bargaining as a solution to case backlog were discussed. Prof.(Dr). G.S Bajpai talked about the development and use of Plea Bargaining in India and Andrew Khuaka, Technical Advisor to Uganda Judiciary presented a case study of Uganda on Plea bargaining as a solution to case backlog. Judge Mike DiReda of the Utah Superior Court, Prof. B.T Kaul, Chairperson, Delhi Judicial Academy, Melissa Mertens- Public Defender, Dr. Aparna Chandra, Assistant Professor of Law and Research Director, Centre for Constitutional Law, Policy and Governance, NLU Delhi, Dr. Mrinal Satish- Associate Professor of Law and Executive Director of the Centre for Constitutional Law, Policy and Governance, NLU Delhi; Lisa Brackelmanns- Public Defender, Juvenile Division; Shabaz Shervani, Case work Director, Counsel to Secure Justice; Dr. Bharti Yadav, Assistant Professor of Law, NLU Delhi and Michelle Mendonca, Project Director, Counsel to Secure Justice made presentations at the Conference. The concluding session on discussion of outcomes from the conference was chaired by Prof. (Dr.) G.S Bajpai, Registrar, National Law University Delhi. 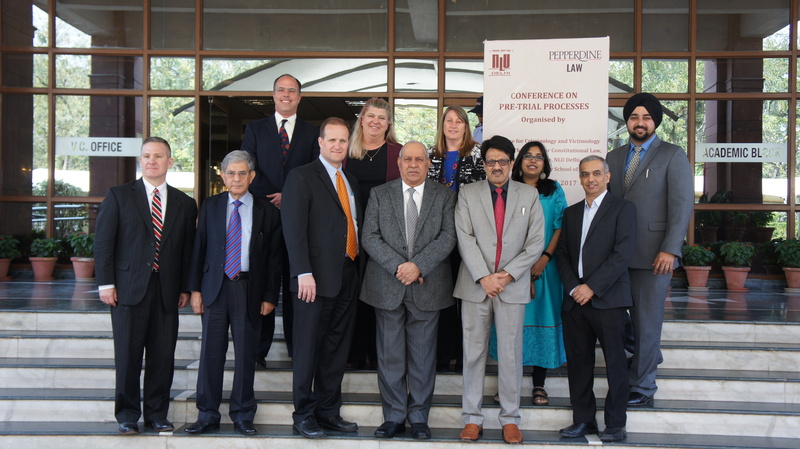 The conference was attended by students from the Pepperdine University as well as the students of National Law University, Delhi. The conference was concluded reiterating the point that the criminal justice system needs to be specialized and that the criminal law in the country becomes a People’s law, rather than the State’s law. 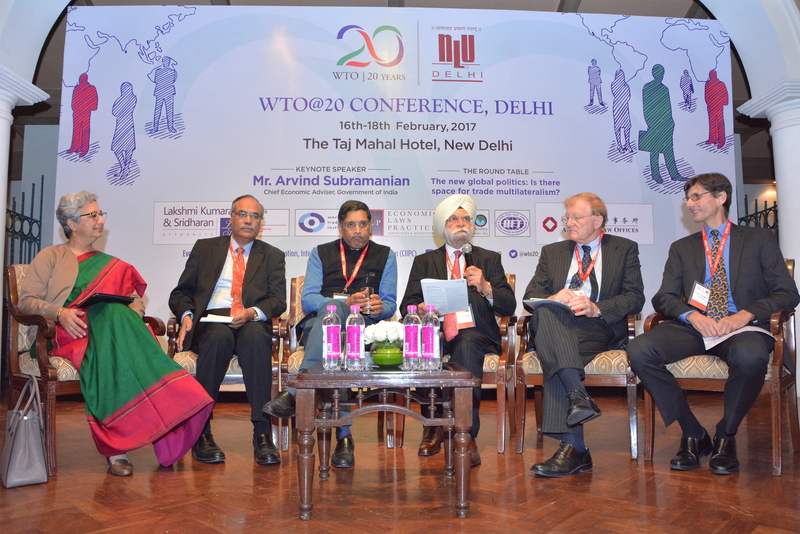 On 16th - 18th February, the Appellate Body of the WTO organized WTO@20 Conference in collaboration with NLUD. The event saw the participation of several Appellate Body members of the WTO, most prominently Mr Ujal Singh Bhatia, the current Chairperson. Leading Academicians, International Lawyers, Diplomats and Policy Makers attended the Conference. The Conference started with a keynote address by Mr Arvind Subramaniam, Chief Economic Advisor to the Government of India. He elucidated on the current state and prospects of the multilateral trade regime in the context of India. Following this, the inauguration featured a roundtable discussion focusing upon the topic, “The new global politics: Is there space for multilateralism?”. This roundtable set the tone and tenor for the discussions of the two day conference by inviting diverse perspectives from the distinguished panel. Day 1 (17th February 2016): Drawing from the inaugural events, the first panel addressed the role of the WTO in intellectual property governance. Panelists, noting the prominence of TRIPS in the employment of the Dispute Settlement Mechanism, elaborated on the challenges and the opportunities presented by the TRIPS Regime. The second panel focused on the evolution and challenges posed by trade remedy disputes at the WTO. The panel impressed upon the nuances of the WTO Dispute Settlement Model, with particular emphasis on its efficacy and reliability given trade asymmetries. The next panel carried the conversation forward by looking at the participation of developing countries in the WTO system. The panel put special emphasis on data relating to the participation, drawing lessons to be learnt in increasing developing country agency at the WTO. The final panel for the day looked at the rise of services and its scope within the WTO Regime. Complementing economic growth trajectories and the share of services with elaboration upon the extent of flexibility offered by the TRIMS regime, the panel shed light on the growing importance of services. Day 2 (18th February 2016): The first panel for the day focused on the dispute settlement mechanism of the WTO with its place in global governance. The complex relationship of multilateral and bilateral treaties to the WTO regime were discussed keeping in mind the resurgence of protectionist politics across the globe. A narrative noting the presence of an opportunity within the proliferation of fear in the global space was given definite shape through the comparative evaluations of different models, including questions of legitimacy and participation. The final panel of the Conference concerned non-trade concerns at the WTO. The embedded nature of trade with important concerns like health, human rights, public morals etc was recognized. Panelists reflected upon the growing importance of non-trade concerns at the WTO as signs of maturity within the WTO. This also brought an eventful reflection as to the concerns raised through the diverse sessions as to the future of the WTO. National Law University Delhi organised a daylong ‘National Conference on Language Diversity, Endangerment, and Vitalization: Agenda and Roadmap’ on 21 January 2017, undertaken under the UGC funded research project on indigenous and endangered languages. Prof. Ranbir Singh, Vice Chancellor, NLUD inaugurated the conference aptly pointing out the meaning of language extinction as the death of an entire cultural ecosystem since language is representative of a people’s social identity, cultural ethos, and ethnicity. Eminent academics who took part in the conference were Prof. R C Sharma, Head of the Department of Linguistics, University of Delhi, Prof. U N Singh, former Director of Central Institute of Indian Languages, Mysore, Prof. G S Bajpai, Registrar, NLUD, Prof. G Balasubrahmanian, Rector, Dravidian University, Kuppam, Prof. B N Patnaik, Retired Professor, IIT Kanpur, Prof. Vaishna Narang, Prof. Anil Sehrawat, Deputy Director, Amity University, Noida, Prof. Shailendra Singh, Head of the Department, NEHU, Prof. Smita Sinha, Head of the Department of Linguistics, Berhampur University, Prof. Shreesh Choudhary, retired Professor, IIT Madras, and Dr Rajesh Kumar, Associate professor, IIT Madras focused on drawing a roadmap for preserving the cultural, social and linguistic heritage, and identity of our peoples. The participation of international academics Prof. Stephanie Dijoux from Paris West University, Prof. Jakelin Troy from University of Sydney, Australia, and Prof. Maya David from Malaysia by video conferencing added a truly international perspective on a plethora of issues related to language diversity, endangerment, and vitality in India. The conference boasts of as many as thirty-two researchers presenting their perspectives on languages facing the threat of extinction. Prof. Prasannanshu, the Conference Chair shed light on language endangerment and preservation in the spirit of the Indian constitutional provisions. He thanked the participants for their soulful participation and dedication, and noted that the conference was only the first in a series of academic initiatives that will also start a vigorous discourse, and a series of actions on the issue of language endangerment by broadening the horizons of research and applications of Linguistics to the fields of social planning and welfare. Prof. Prasannanshu was emphatic in noting the vision and role of Prof. Ranbir Singh in hosting this mammoth research programme in NLUD.